transformation” (72). Chapter 3, by Matthew Sweet Vanderpoel, claims that the illustration January by the Limbourg brothers subtly portrays a view of the place of nobility in society, and in so doing conveys an understanding of how God has ordered the world. In Chapter 4, Matthew Milliner draws from the Brancacci Chapel in Florence to challenge art history to continue in a direction of “religiously enriched scholarship” (106). In Chapter 5, Henry Luttikhuizen uses Walford’s conviction that “a painted landscape … is never a pure copy of nature and therefore can never be rendered value free” (109) to argue that such art conveys ubiquitous signs of divine providence and even the “presence of a gracious God” (120). Chapter 6, by William Dyrness, examines the ways in which the viewer of Holbein’s work can perceive the “spiritual content” of art, which was one of Walford’s chief concerns. In Chapter 7, Rachel-Anne Johnson aims for “the reconciliation of the secular and spiritual understandings of Hunters in the Snow” by examining the way in which the painting would have been received by its local audience. Chapter 8, by Jan Laurens Siesling, claims that Saenredam’s Odulphus exemplifies a “spiritual patriotism reflective of the age,” in which iconoclastic concerns met with the need for a visual element of faith. In Chapter 9, Calvin Seerveld uses Walford’s Great Themes in Art to assess Watteau’s work. The next chapter, by Kaia Magnusen, explores Friedrich’s then-novel emphasis on “common landscape features in a work of art specifically intended for a religious purpose” (186). Magnusen claims that such an emphasis conveys that “not only does the created world reflect the glory of God, but the natural world can be used to convey profound religious truth” (191). In Chapter 11, Anne Roberts argues that Constable’s 1828 painting represents a turning point in the history of English landscape painting, going so far as to say that Constable “almost single-handedly revolutionized English ideas on what constitutes a beautiful landscape” (205). In Chapter 12, editor James Romaine argues that van Gogh’s Sower exhibits motifs that reveal the artist’s view of his own work, and he even claims “if any painting might be called a portrait of Vincent’s conception of a Christ-imitating artist, Sower with Setting Sun visually manifests the artistic endeavor as a creative act of faith” (222). In Chapter 13, Graham Birtwistle examines Walford’s treatment of Mondrian’s painting, especially Walford’s view that Flowering Apple Treerepresents a key stage in the evolution of Mondrian’s art toward more abstract works. In Chapter 14, Linda Stratford uses hermeneutical principles advanced in Walford’s Great Themes in Art to argue that Pollock’s Autumn Rhythm “may be seen as an allegorical representation of spiritual rebirth, and indeed, resurrection” (239). In Chapter 15, James Watkins, explores disputes in the academic reception of Beuys’s performance art. An afterword by Joel Sheesley offers a portrait of Walford’s career as a professor of art history at Wheaton College. The volume is beautifully illustrated with sixteen color plates. Romaine’s efforts will be valuable to those wishing to understand better the importance of Walford for art history, and the wide range of topics gives an arresting sweep to the volume. 4–7 compose a section titled “Practical Application” in which ​​McCullough applies his theoretical framework to concrete cases. Chapter 4, “T. S. Eliot: Four Quartets,” claims that the poet wrote “spiritually sensitive artwork in the midst of encroaching European secularism” (70). Chapter 5, “Makoto Fujimura: The Four Holy Gospels,” investigates five paintings by Fujimura, and McCullough explores, among other things, the relationship between abstract art and Christian theology. Chapter 6, “James MacMillan: Seven Last Words from the Cross,” holds that MacMillan’s great musical work redresses the imbalance evident in much Christian theology in which a theology of glory is emphasized to the exclusion of a theology of the cross. Chapter 7, “Conclusion: What Are They Saying?,” examines the section as a whole to suggest that all four of the artists are, in various ways, saying something that connects their art with ascesis. Chapter 8, “Eyes that See, Ears that Hear,” concludes the volume with a reflection on the ability of art to elicit sustained attention and transformed perception, and in so doing to contribute importantly to spiritual formation. “Gallery Models,” describes three different models of galleries: those designed for the local congregation, those geared toward the congregation and local faith community, and a professionally curated gallery. 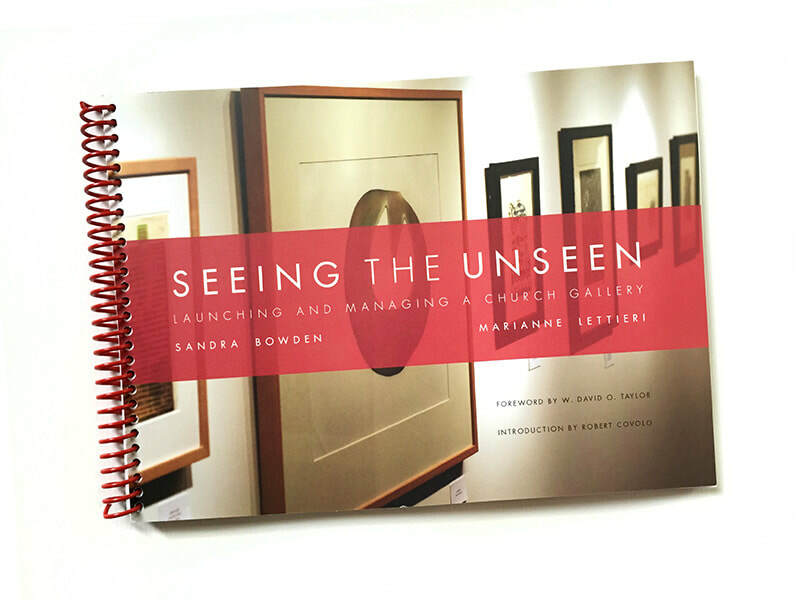 Section 3, “Designing the Gallery Space,” lends resources to those attempting to discern where in a church art should be displayed, and it discusses possibilities for churches that do not have dedicated gallery space. Section 4, “Funding the Gallery,” explores possibilities for a wide range of funding levels. Section 5, “Business Administration,” provides readers with a number of practical reflections (security, insurance, artist honoraria, and artist loan agreement). Section 6, “Planning Exhibits,” considers issues such as length, frequency, curatorial research, themes, messages, and controversy in the exhibit-planning process. Section 7, “Kinds of Exhibits,” invites organizers to think about the goals of their galleries, as those goals will dictate the type of exhibit that will be displayed. Section 8, “Organizing Juried Shows,” warns organizers about the tendency for juried shows to be enormously time-consuming, but it also insists that the return on such an investment can be great. Section 9, “How to Handle Art,” offers more practical advice, as does Section 10, “Installing Exhibits.” Both sections will be helpful to novice exhibition leaders. Section 11, “Engaging Viewers,” presents a number of strategies for drawing people into exhibits, and it connects nicely with Section 12, “Promotion and Publicity.” Section 13, “Useful Resources,” mentions a number of websites and print materials that stand to deepen understanding of the many issues in play for organizing church galleries. Overall, Bowden and Lettieri have given their readers an engaging set of reflections on the practical and theoretical dimensions of launching and managing church galleries. 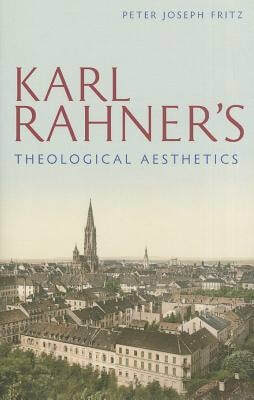 foremost contributions of the volume is its claim that Heidegger enabled Rahner to become a “counter-subjective” theologian, and that Rahner should not continue to be viewed as one who followed Kant in turning to the subject (as has been typically thought in academic treatments of Rahner’s theology). Chapter 1, “Rahner’s Aesthetics,” makes three claims. First, Fritz maintains that Heidegger planted in Rahner’s developing thought a fondness for aesthetics that would influence him for the rest of his career. Second, to Fritz, Rahner’s seminal Spirit in the World establishes foundations for a theological aesthetic, although Rahner does not name it as such. Third, Rahner’s version of aesthetics retains and amplifies the strengths of Heidegger’s thought, while resisting its shortcomings. Most important among Rahner’s departures from Heidegger concerns the latter’s barring infinitude from philosophy. Chapter 2, “Rahner’s Sublime,” holds that a distinctively Rahnerian version of the sublime can be used to challenge the perception that Rahner is a theologian who has turned to the subject. Fritz holds that this “Catholic sublime” was inspired by Heidegger, especially the lectures on Hölderlin, and that it is observed especially in Rahner’s 1958 essay, “Priest and Poet.” The version of Rahner that emerges from this chapter does not think of the subject as “a home unto itself;” instead the subject is one who, “‘in returning to itself,’ places itself before God” (109). Chapter 3, “Rahner and the Spirit of the Age,” investigates Rahner’s angelology and his use of the thought of Ignatius of Loyola in order to demonstrate further just how significantly Rahner breaks from a theological method that begins with the modern subject. Somewhat unexpectedly, Fritz maintains that a resonance can be found between the treatment of angels in Rahner and Heidegger. In his examination of Rainer Maria Rilke’s poetry, Heidegger advances a notion of the angel as one who “looks ahead to a kind of spirit not beholden to modern subjectivity” (111). To Fritz, Rahner’s treatment of angels similarly “sets up a field of resistance against the modern subject’s self-sufficient intellection,” reinforcing the claims made in Chapter 2 about the spirit as a “sublime-aesthetic receiver” (111). Additionally, Rahner’s discussions of Ignatius serve as an especially lucid moment when Rahner looks beyond the spirit of modernity. Chapter 4, “Rahner’s Refounding of Theological Language,” argues that Rahner advances an understanding of language that “(1) allows God’s mystery to remain mysterious, (2) without despairing of language’s capacity to speak truly of God” (158). The chapter proceeds in four parts, the first of which explicates Rahner’s view of language as centering on God’s incomprehensibility, especially in essays such as “The Concept of Mystery in Catholic Theology” (1959) and “Reflections on Methodology in Theology” (1969). The second part of the chapter argues that Rahner’s understanding of language resembles that of Heidegger in that both “describe a way of thinking about language that overturns the metaphysical tradition’s privileging of assertion, thus laying bare the mystery that comprises language’s essence” (158). Part three draws comparisons between Rahner’s Mariology and Heidegger’s reflections on “the thing.” Here Fritz claims that both figures “perform a nonobjective use of language” (158). Part four notes the differences that remain between Rahner and Heidegger on language. Chapter 5, “Rahner’s Apocalypse,” claims that Rahner’s counter-subjective aesthetics culminates in his (surprisingly apocalyptic) vision of history. Given the title of the volume, one might have expected more sustained connections between Rahner’s thought and the well-known theological aesthetics of Hans Urs von Balthasar; nevertheless Fritz has made a substantial contribution to studies of Rahner, modern Catholic theology, and theological aesthetics.